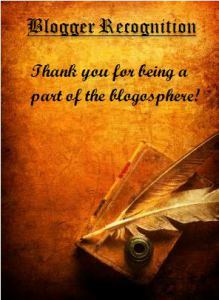 Many thanks to Cricket Muse for the nomination for the Blogger Recognition Award! How kind of her to share this award and include me on her list of nominees. Write a post to show off your award. Give a brief story of how your blog got started, and give a piece or two of advice to new bloggers. Thank whoever nominated you, and provide a link to their blog. List who you’ve nominated in the post. Make sure to also attach the award itself! Why Blogging and Literary Distractions? You can find the origins of this blog in my “About” page, but to introduce new readers to Literary Distractions: This blog began as a semester-long course project when I was an undergrad (5 years ago!). We had to write weekly posts about whatever topic (some wrote about sports, others movies, etc.) we wanted. I was originally going to do reviews of books and short stories I had to read for other classes (hence “Literary Distractions”), but ended up taking pictures of graffiti I found in bathroom stalls around campus and commented on those. After the semester ended, I didn’t want this blog to just exist, forever untouched again, with virtual cobwebs. Since then, I’ve been trying to write about whatever I find interesting: my “literary adventures,” book fairs, book reviews, etc. My advice? Not everyone is going to “like” what you post, so don’t take it personally. Think about it this way: Would you read or “like” what you wrote if you read it on someone else’s blog? It’s okay to stumble and struggle at times, and it’s great to get positive feedback, but don’t get caught up in your blog stats if that’s all that matters to you. Write about what you enjoy and write about it as often as you can, and you’ll find many others who share the same interests as you! Also, participating in weekly memes like Top Ten Tuesday or Musing Monday is a way for you to share your favorites with others, meet other fabulous book bloggers and be a part of this great community. Thank you so much for the nomination! I am honored!! However I must decline due to lack of time right now (for nominating other blogs, writing the post, etc). But again thank you for thinking of me!! Contributing editor at Niche Literary Magazine (www.nichelitmag.com), copywriter, freelancer, occasional blogger, constant reader. Last Call – Going, Going, Gone! I’m Moving — New Site!